IN THIS REPEAT: An interview about The Faun's Bookself by Dr. Charlie Starr.. A book that released this year (2018). 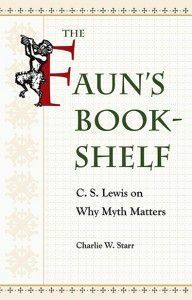 The Faun's Bookshelf is an interesting title that explores, as part of the subtitle reveals, "Why Myth Matters." Dr. Charlie Starr, the author, uses books C.S. Lewis mentions on Mr. Tumnus's bookshelf as the framework to examine what myth means and how it teaches us about reality. This interviewed was recorded on the campus of Taylor University the day before the 11th Frances W. Ewbank Colloquium, where he gave one of the keynote talks. Even though Charlie goes into a lot of deal about his book in this interview, you will learn even more about myth by purchasing his book (direct link given below). Speak thanks to Dr. Crystal Hurd who voiced the endorsement given at the start and also an except from Charlie's book.